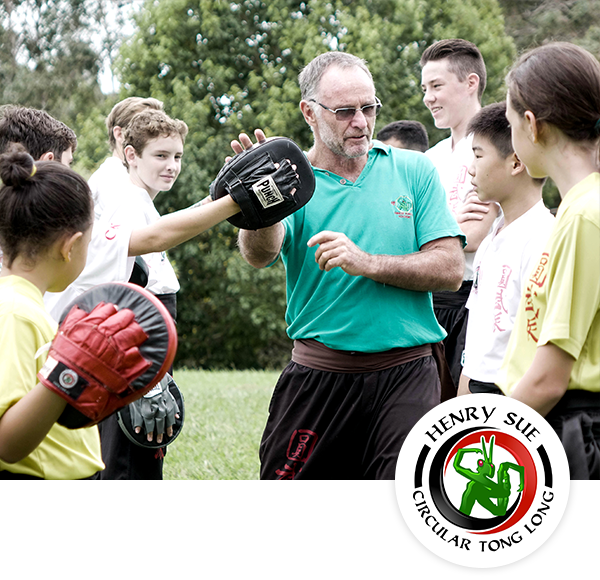 A safe kids martial arts Gold Coast school for your child to learn Kung Fu, have fun and make new friends. Kung Fu is an incredible practice to foster self-confidence and develop personal skills that encourage kids to become the best version of themselves. 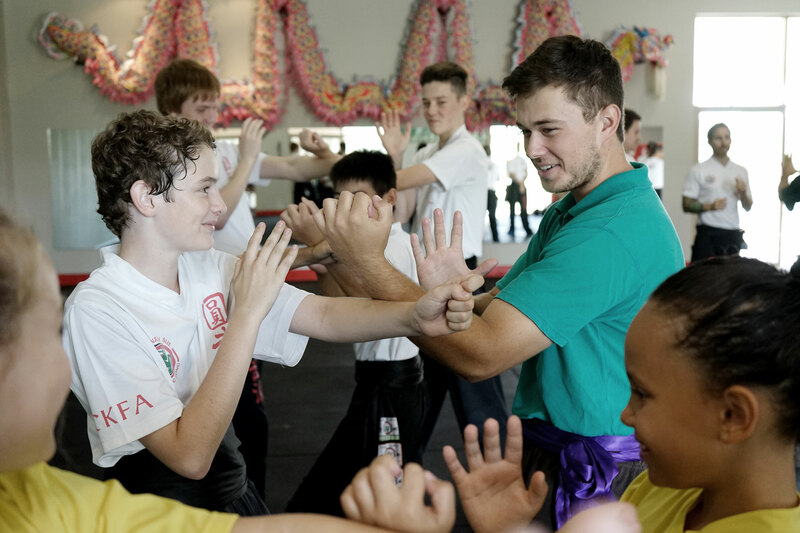 Our kids martial arts Gold Coast instructors teach the group a modified version of the adult Kung Fu curriculum, and for our youngest members, a range of animal inspired Kung Fu moves. Their number one priority is fostering a fun and safe environment where kids naturally thrive. With a focus on martial morality, classes aim to develop courage, character, behaviour and attitude while providing a good workout that builds coordination, motor skills, balance, flexibility and fitness. We cultivate kids who have respect and appreciation for parents, teachers, instructors and other mentors facilitating character development that will help your child to lead a successful life well into the future. 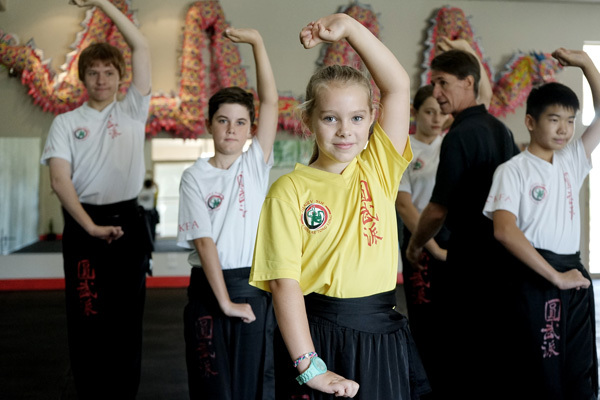 Our kids martial arts Gold Coast classes are suitable for boys and girls aged 4-17. Kids martial arts Gold Coast classes are a great way to instil a sense of confidence in kids so that they have the courage to stand up for themselves and their friends. As classes cover morality of mind as well as the physical practice of Kung Fu, kids learn to understand the difference between being assertive and being a bully. We truly believe martial arts is something every child should be learning as it builds self-worth and resilience, providing them with life skills they can lean on through the years. Get your child started with our introductory pack—three classes for only $19. The traditional Southern Kung Fu system takes its power from Ma (the correct stance). This stance involves gripping the floor at just the right moment to generate and deliver maximum power to the striking surface. 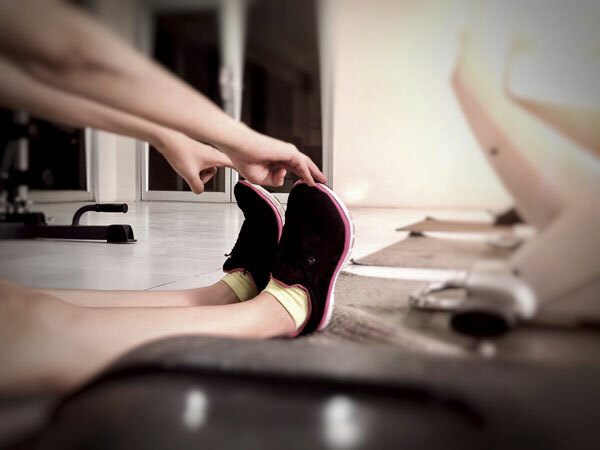 The power then moves from the feet, up through the legs and body and out the fist, transforming the entire body into a powerful driving force. Basically a ‘close in’ fighting system, Southern Preying Mantis is known for its ‘one-inch strikes’—similar to the one-inch punch made famous by the legendary Bruce Lee. Mantis practitioners do not give their opponents a chance to deliver more than one blow. The practitioner turns defence into attack by striking immediately. The theory is to get your opponent off-balance and not let them regain it, and at the same time, shift in close and attack with many rapid-fire short strikes.Many of the strikes are open palm attacks for a faster delivery. The characteristic fist of the system is the ‘phoenix eye fist’, which the mantis practitioner uses to attack pressure points. The distance needed to provide Southern Preying Mantis’s devastating power becomes shorter over time as training moves from externally generated power to internally generated power. In this system, with regular discipline, it will become possible to knock someone out with just your palm contacting the head, without any need to physically draw back your arm beforehand. Essentially, Circular Preying Mantis Kung Fu doesn’t practice blocking. Instead, ‘blocks’ are initiated as attacks. Defence takes the form of striking any incoming limbs with a ferocity that immediately puts the attacker on the back foot. The initial ‘block’ can be used as an attack to redirect the force of their attacking blow, but it is still a hit with maximum power. This power is not used directly against force in the Preying Mantis system. That wastes valuable time. Using Tai Chi principles we redirect the blow and immediately counterattack with rapid, multiple strikes. What better way to deter a would-be attacker than delivering power that instantly produces fear? If you can hit hard enough a person will faint, whether you hit their head, arm, or body. Southern Mantis Kung Fu fighting style weapons include, the Staff, Tridents (or Sai’s), Walking Stick, Single and Double Short Sticks, Single Broadsword, Butterfly Swords, Tai Chi Sabre, and Tai Chi Fan. Weapons are taught to students after they have spent time on the basics. Specific weapons are introduced in certain grades to enhance the understanding and power of the techniques. 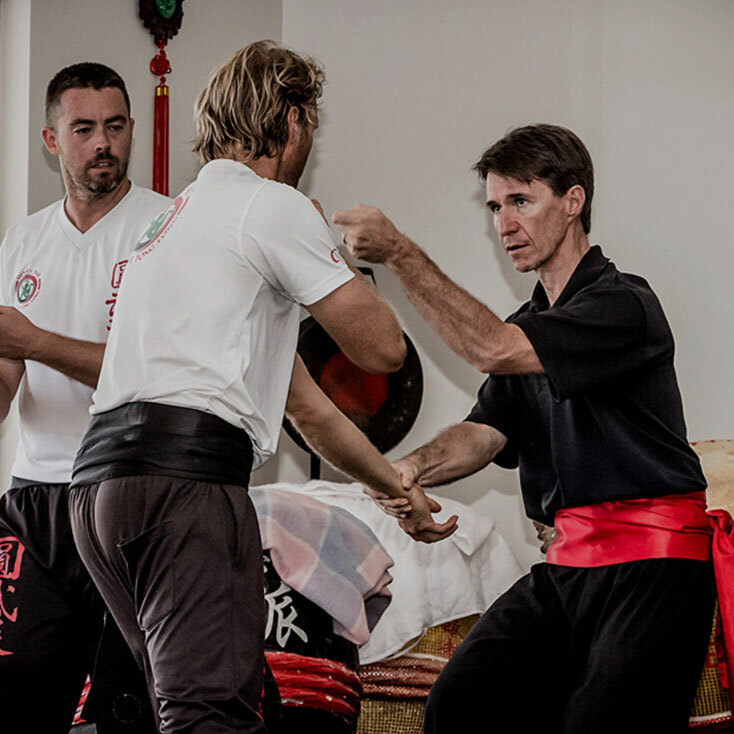 Get fit while learning how to defend yourself under the expert tutelage of Sifu Marc Webster (6th degree expert) and his team of experienced instructors. Study a modern take on an ancient practice with Henry Sue Circular Tong Long Kung Fu. This high intensity workout is designed to help build your fitness and strength while maximising your body’s fat burning ability. 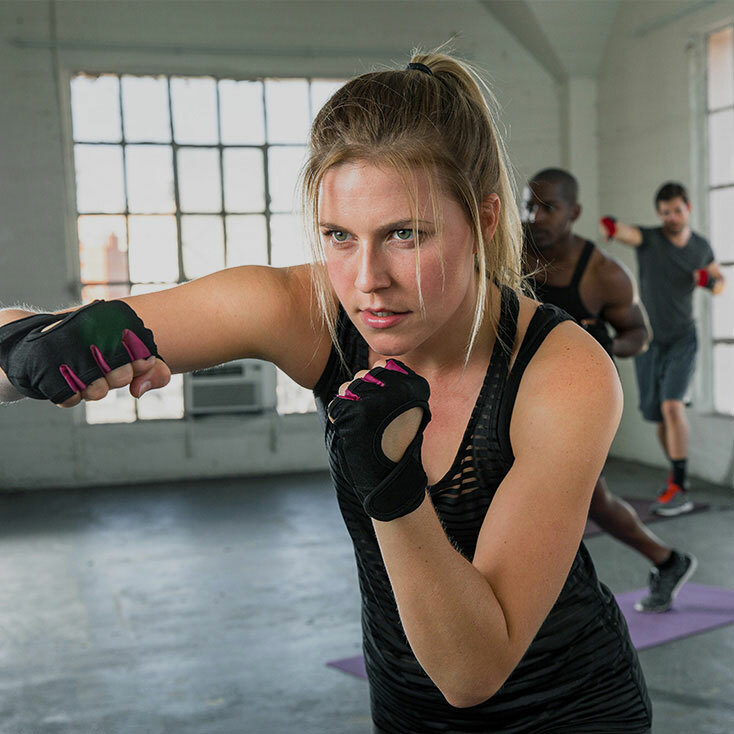 Developed by a Kung Fu master, these classes are inspired by Kung Fu and Kickboxing. Based on the expertise of Kit Laughlin, creator of the Stretch Therapy™ system, our Flex classes also utilise methods from Chinese Dao Yin, Japanese Sotai and meridian stretches to improve your posture, flexibility and range of motion. Kung Fu is a great fun workout and you get strong, fit and healthy. I think other kids should train Kung Fu so like me they can enjoy their lives being healthy, fit, strong and get to learn Kung Fu. My parents say: Our daughter is very introverted and often stands back in group situations. Kung Fu is helping her to become more confident in her abilities. We are very happy to see her engaging with her peers. What I enjoy most about Kung Fu is my Sifu, staying healthy, the community and I enjoy being calm when you slow down and concentrate on one thing. I think other kids should do Kung Fu because they will become more disciplined, confident, fit and healthy and enjoy doing it while learning to defend themselves. My parents say: He has become more confident, is more aware of keeping body and mind healthy and, by representing the club in performance events, he is learning to give back to teacher and club, and be a good example in his behaviour when in public. I like knowing that I have self defense which makes me feel confident, also I have friends outside of school. The performance aspect gives me strength and another activity.I thin other kids should train Kung Fu because they would gain the same skills that I have and they will have fun and feel confident and strong. My parents say: It has improved his discipline and commitment. This club in particular has a sense of community that has been enormously supportive and inclusive which is critical in these formative years. The thing I like most about Kung Fu is how there is so much energy and so many styles of energy. Kung Fu has helped me become a more generous person and has made me stronger, mentally and physically. I think others should train Kung Fu because it is good for your body and soul and helps you to become a better person. I like my form because it's most fun. I think others should train Kung Fu so they can learn to defend themselves. My parents say: Kung Fu has benefited Roman by helping him to become more focused, have more endurance and become stronger. Kung Fu is fun and good for your body. It trains your horse mind. My parents say: He has improved focus - we often discuss horse vs monkey mind. Jack is gaining a clearer understanding of what being respectful means. I enjoy Kung Fu because of the interesting techniques that are in the system. They each show how we may apply their power in a variety of situations. Kung Fu will help develop your respect, willpower, courage and strength. It will also teach you about Chinese culture. What my parents say: Ruben has grown - physically, mentally and spiritually over the years. Sifu's teachings have instilled confidence in Ruben in all that he does. Max likes making new friends and to learn from Sifu, and he thinks others should train to learn something new and have fun. Ruby likes making friends, learning new routines and it makes her happy. She thinks others should train Kung Fu so they can learn new things and make new friends. Their parents say: Kung Fu has given Max more respect and discipline, and given Ruby an eagerness to try new activities.